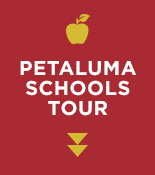 When it comes to K-12 education, Petaluma is all about options–and quality. According to GreatSchools.org, Petaluma schools rank 7 out of 10, comparable to Berkeley and Mountain View, and better than San Francisco schools scoring 6 out of 10. There are also a variety of private schools for those interested in Catholic, Christian, and alternative education models. The Petaluma area is served by 13 public school districts and 36 public schools, including 7 charter schools and 3 historic “one-room” schoolhouses. 12 of Petaluma’s public schools are California Distinguished schools and 4 are Federal Blue Ribbon Schools. Petaluma’s public charter schools are an option for families seeking a public school education delivered within a specific focus known as a charter. The charter schools in Petaluma include Mary Collins at Cherry Valley (environment/performing arts); River Montessori (Montessori-inspired); Loma Vista Academy (Spanish Immersion); Live Oak (Waldorf-inspired); McKinley Accelerated Charter (Accelerated learning); Sixth Grade Academy (technology); and Cinnabar 7th & 8th Grade Charter School. Petaluma offers private education at six schools with focuses ranging from Catholic and Christian perspectives as well as a Montessori elementary and a school for children with autism and cerebral palsy. *Requires Internet Explorer 10, Firefox, Chrome or Safari browser on a desktop computer for fully functioning tour.